The USPS® 2017 price changes will go into effect on Sunday January 22nd, 2017. While this represents an increase from 47 to 49 cents for most consumers mailing First Class letters, other product will see varying price adjustments. Metered mail will actually go down from 46.5 cents to 46 cents. The change will also allow one price for First-Class Commercial Letters up to 3.5 ounces instead of the current 2 ounces, which means you can put more promotional inserts into your bills and statements without paying additional postage. 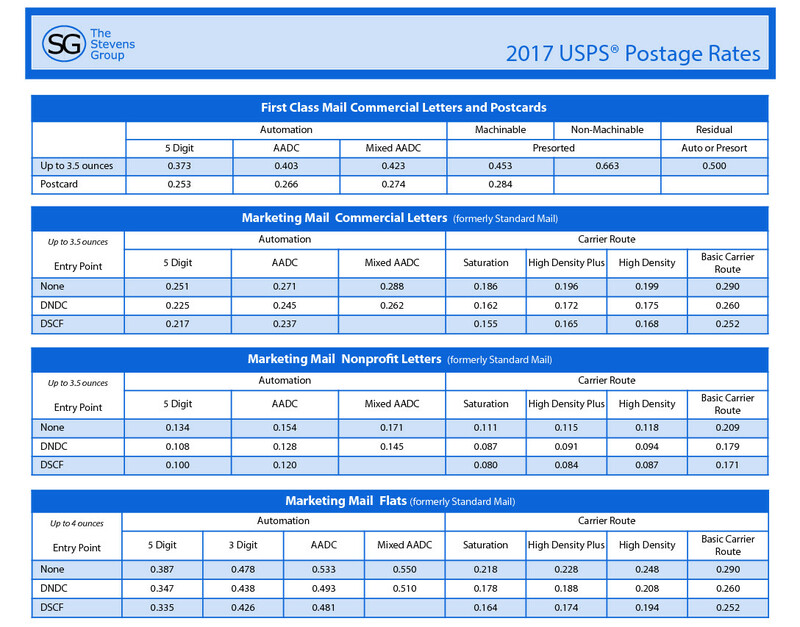 See the attached 2017 USPS® Postage Rate Increase Guide PDF for more information. Below are of some of the new USPS Postage Rates. Standard Mail has been renamed Marketing Mail.